"Why do you have to lie all the time?" Even an artist as great as Federico Fellini can succumb to the mediocre ubiquity of so much of television, and in many respects this is his movie about the mind-numbing things that come out of that little box. Fellini's affection for the outrageous and the charmingly vulgar don't stand a chance against the hours and hours that TV churns out, either to entertain us or to get us to buy things, or both; it overstates the case to say that this movie is only a slightly acrid exercise in nostalgia, but at times it certainly feels like the filmmaker is testing our good nature. 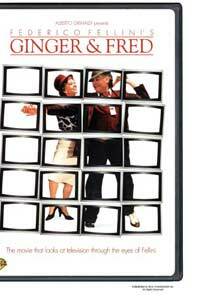 The title refers to the stage names of an Italian dance team, long since disbanded, that met with some success imitating their American namesakes, and now Ginger and Fred are to be reunited on a TV show called "We Are Proud To Present". Offstage, Ginger is Amelia, a grandmother, who has fond memories of her old partner and their old act, happy times from long ago; she's moved on just fine, but you couldn't really say the same for her Fred, Pippo, who is disheveled, a mess, and, we later learn, took the end of the act as a punch to the stomach, not as an appropriate moving on. Curiosity, a trip to Rome, a modest paycheck and a chance for one last spin in the spotlight convince them to come together for the reunion show, their first public appearance together in decades, and the first time they will have seen one another in years. Certainly some of the director's trademark attributes are on display, and backstage at the TV show is truly a human carnival—drag queens and little people, celebrity impersonators of all stripes, everything but the camels and elephants. And Fellini is never mean spirited—this could have been an exercise in misanthropy, but the director's sunny nature infuses it with a little bit of the hey-kids-let's-put-on-a-show spirit. But you can't help but think that Fellini and his collaborators are wheezing through this one a little bit, and that they blame what they perceive as the decline in the public aesthetic on television. There's a set on in just about every room in the movie, invariably running a sexualized advertisement for a banal product—you might not have known that there were so many fantasies inherent in hand cream and dish soap, but buy our product and find out for yourself! And at times it's like the movie itself is distracted by all the light and noise coming from the corner of the room. You almost wish that Fellini had channeled a little more of that anger; on some level, it's more interesting than the predictable storyline he lays out for us. But the director is content it seems to leave the recriminations to others, and simply to observe how strange and fascinating we all are, even if we're not on television. Image Transfer Review: The transfer is a pretty dull one, and looks as if the colors have been allowed to bleed out over the years without any attention—I doubt that Fellini intended it, but a sad and muddy brown is the predominating color in the palette. Audio Transfer Review: As with many other Fellini pictures, a huge percentage of the dialogue is dubbed, and on the DVD the audio mix hasn't done much to mask that—room tone and static levels are uneven, but this may be an issue for you only if you're an Italophile. Extras Review: Only an original trailer. It helps to have a reservoir of good will toward the director and his two stars as you watch this movie; without it, it feels a little warmed over, but still very good natured. Fellini never lost his eye for the peculiarities in the day to day, and the incidental atmosphere of this film is in many respects more compelling than its story.